If you've been reading my blog for a while, you've probably guessed by now that I'm a total Christmas fanatic. It's hands down my favourite time of the year and I just love everything about it. With this being said, when Littlewoods contacted me to tell me about the #MakeTheirChristmas campaign and asked me to share my favourite things about the festive season, I jumped at the chance. I thought it'd be fun to share my favourite things about the festive season and what makes it special for me. I'm sure we all have different things we love about Christmas or our own little family traditions so here's a few of my favourite things. 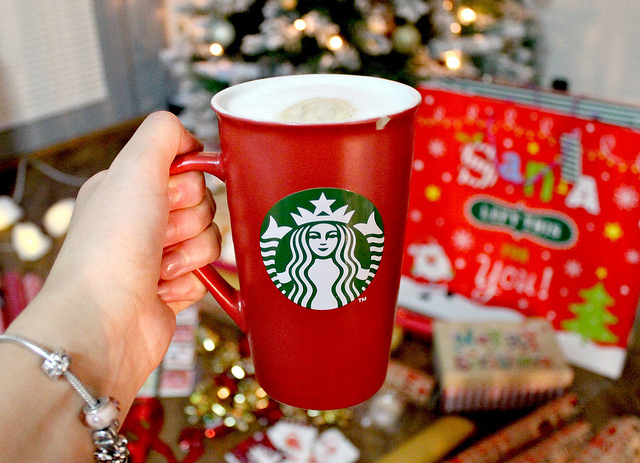 Starbucks Christmas Lattes; I thought I'd start with this as the header picture is me holding my festive red Starbucks mug after all. I'm going to guess this is on a lot of people's 'favourite things about Christmas' lists but getting myself a Gingerbread latte from Starbucks in the famous red cup is one of my Christmas traditions and I get excited for them to be released every year. Nothing beats being wrapped up warm with a Christmas drink in hand - there's something so comforting about it. I also buy myself the Nescafe Gingerbread latte sachets as a substitute for Starbucks and again, they're just Christmas in a cup for me. Putting the decorations up; I think putting my Christmas decorations up is one of my favourite days of the whole year as it makes me feel so festive and it means Christmas is just around the corner. I try to put mine up on the 1st December every year but was actually a little bit naughty this year and put them up on 29th November instead - I just couldn't wait any longer! 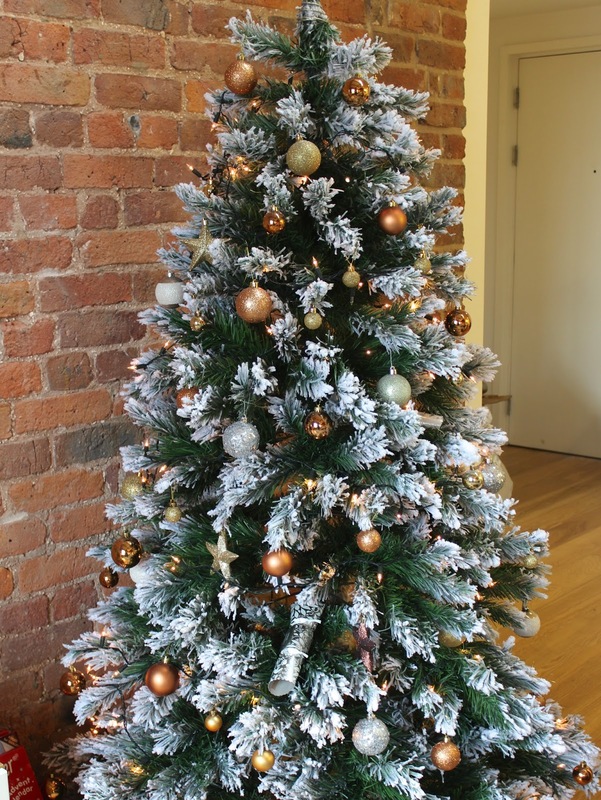 As you can see from the photos above, I've gone for a copper/gold and silver theme on my tree and I absolutely love it. I think it looks really chic but also makes my living room super cosy. I've also wrapped some copper wire fairy lights around the main beam on our living room ceiling and again, it makes them place feel so cosy. Christmas scents; For me, Christmas isn't Christmas if my flat isn't filled with beautiful Christmas scents and this year, this 'Sandalwood and Amber' room spray is my absolute favourite. I've been spraying it around the room non-stop, much to my boyfriends annoyance hehe!! Also, it comes in a copper bottle to match my decorations - obvs?! I also love dotting Christmas scented candles around the place so when I walk into a room I'm hit with the smell of Christmas. Ahhh!! Manchester Christmas Markets; If you didn't know, I'm currently living in Manchester so the amazing Christmas markets here are a huge part of my Christmas. They're here for the whole month of December and are HUGE which is amazing as it means there's always something to see. I actually went to them for a mulled wine at the weekend and it just makes me feel so, so, so festive every time I go. Also, you just cannot beat the little dutch pancakes from the markets. I have to get them every year so that's definitely a tradition of mine. Yum! If you live near Manchester or fancy something to do for a Christmas weekend away, I'd highly recommend paying them a visit as you'll be sure to leave them full of Christmas spirit. 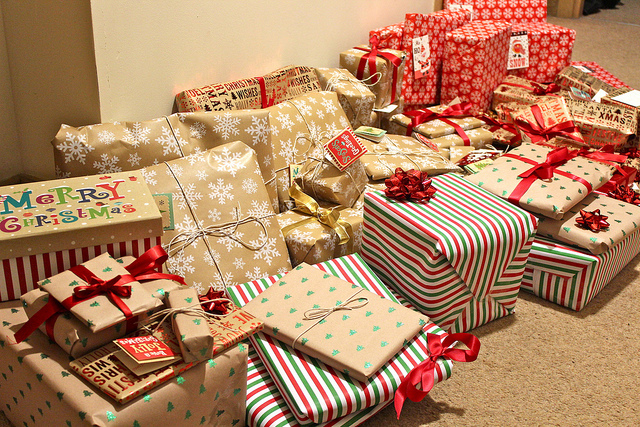 Buying & Wrapping presents; One of my favourite parts of Christmas is 100% buying my family Christmas gifts. Christmas is a time for giving after all and I love nothing more than getting wrapped up for a day of shopping, picking out things I know the recipient is going to love and wrapping it up beautifully for them to open on Christmas morning. I love seeing people's reactions to the gifts I've bought them and love to get creative with my wrapping so it's definitely one of my favourite parts of Christmas. I bought the cute hessian sack above the other day to pop my boyfriends presents in this year and I think it's SO cute!! Make sure you check out the Littlewood Christmas range this year too as they've got some amazing gifts for the whole family. Seriously, you could do your whole Christmas shop on the Littlewoods website. Christmas Beauty Gifts; As a beauty lover, I'm always in my element at this time of year as my favourite beauty brands release the most amazing gift sets. I always think gift sets are such great value for money and I love receiving them as gifts and buying them too! I'm planning to do a huge Christmas gift guide featuring some amazing beauty gifts soon so make sure you keep your eyes peeled for that if you need a few ideas. Of course there's plenty more things I love about Christmas but I'd be here all day if I was to list them all. However, my ultimate favourite thing about Christmas would definitely be spending quality time with my family and friends. It's so lovely to get together with all my nearest and dearest over Christmas as everyone is always so happy and relaxed which is amazing to see. I can't wait!! Make sure you check out the Littlewoods Christmas advert which I've popped below - it's super cute and shows what Christmas is all about - knowing the loved ones in our life are happy is all we could really ever wish for. Plus, the music in the advert and Myleene Klass playing the piano are beautiful!! I'd love to hear what your favourite things about Christmas are so let me know in the comments below of tweet me @k_leexjx using the hashtag #MakeTheirChristmas. Great photography, love the Santa sack! This is so cute, I love all the little bits that make Christmas! Love this post! Cannot beat a christmas drink and that tree is gorgeous! I'm yet to go to Starbucks for my Christmas drink! I love wrapping up presents and finding the perfect present for each person I want to give a gift too, it feels so lovely to do so! 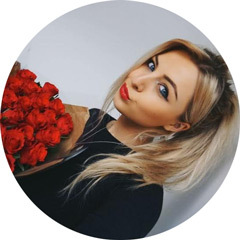 Your flat is just perfect! Beautiful photos <3 I love putting the decorations up that's my favourite part and listening to Christmas music in the car! I didn't know you was in manchester! I'm in Manchester and I find the Christmas Markets majorly cramped, especially early evening, you cant even move lol! I still go every year it's super festive and cute! I feel like I need that room spray in my life! I agree with everything you said, I love Christmas! I love Christmas, it's my favourite time of year too. Putting up the decorations is my fav! I went to the Manchester Christmas markets this year and they were so good, made me feel so festive! Your photos are great! Christmas is also my favourite time of the year :) I'm excited to get a tree when I'm home from uni! I love Christmas trees, Christmas food, Christmas music, mulled wine and Costas Black Forest Hot Chocolate! I just love everything about Christmas really... haha x But wrapping and giving presents is definitely my favourite part!